HCM CITY — The CV9 Academy, an academy of Football for All was opened yesterday in HCM City. “This institute is my long-nurtured dream. 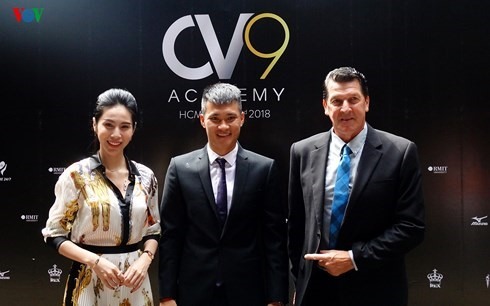 In the short term, Media Pool Company and I, alongside other partners, will build a strong sporty environment for trainees aged between 6-15 years old,” said Lê Công Vinh, former captain of Việt Nam senior football team and founder of the CV9 Institute. “I want to open the CV9 Institute to help juniors develop physical strength, as well as a spirit of unity, to help each other in sport. The institute is also a place for juniors to develop their passion of football,” said Vinh. Vinh invited former Australian national footballer Marshall Soper to be a technical consultant for his institute. The Institute also invited foreign and domestic coaches to train, including female footballer Nguyễn Thị Kim Hồng of Việt Nam women’s football team. Vinh is acting chairman of the V.League 1 side HCM City FC. He was part of the Vietnamese national team from 2004 to 2016.